Planning Permission has been granted for BFF’s scheme for 41 new dwellings at Dixon Clark Court. The scheme is the latest in a succession of new build housing projects designed by BFF for Islington Council on areas of social housing identified as capable of being significantly improved as better places to live, with new homes and landscaping. The existing Dixon Clark Court estate consists of a single residential tower surrounded mostly by tarmac and concrete except for a fenced-off communal garden and a grassed area and trees that screen it from the busy Highbury Corner roundabout. Planned improvements by TfL and the London Borough of Islington will replace the existing roundabout to create a new publicly accessible Arboretum. The 41 new apartments, 27 for social rent, are arranged in individual houses around the existing tower to place it in a mews setting. 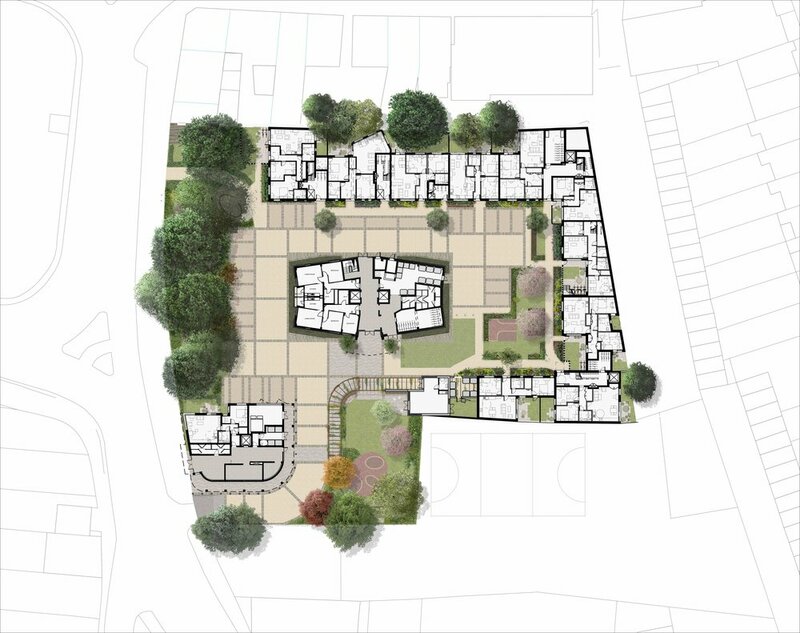 It will establish a new enhanced garden setting for the existing tower, and the existing 59 flats will have, for the first time, a directly accessible communal south-facing garden. The western boundary is to be defined by retaining the majority of existing mature trees, within an improved amenity garden accessible to residents and informally planted in a wild meadow style with some car parking alongside, just to meet the current need. A new residential building onto Canonbury Road frames the existing tower to give a new active street presence and entrance to the estate and some enclosure and shelter to the new internal, shared garden spaces. The mews houses range in height from one to four storeys and contain a variety of unit types and sizes. These are planned with generous ‘through’ spaces between them with courtyard gardens and roof terraces. These ‘through’ spaces allow the passage of light, air, and views and establish an individual identity and human scale for each group of dwellings, with ground level entrance doors. Views both in and out of the site will be experienced by Dixon Clark Court residents and the residents in the neighbouring buildings and the conservation area. The scheme provides 41 new dwellings, well within the permitted density for this city centre site, and there will be an increase in usable, ‘green’ ground-level space. There will be no demolition except for small stores that will be re-provided. Roof terrace areas and greened roof areas will be additional amenities. An added bonus is that the garden spaces are directly accessible from all of the dwellings, making them more practical and likely to be used. A significant increase in the number of trees on the site is planned to provide shade and variety, and to define new spaces. These will more than compensate and exceed the few trees lost as a result of the proposals.